Some of my most enjoyable dining experiences are at EBCs (ethnic bakery cafes). My favorite is BomBon Cafe, which I’ve talked about here and here. Other classics are Letizia’s Natural Bakery in Wicker Park and Cafe Selmarie in Lincoln Square. I’ll visit these multiple times this summer, don’t worry. Chicago is full of EBCs and I’m going to start tagging posts with EBC so you can access them easily. I like the combination of light, inexpensive lunch fare combined with quality dessert items. I’m genetically predisposed to have dessert at the end of my meal but I rarely do so during lunch. However, when I get a smallish lunch like the Artopita from Artopolis, I usually have plenty of room for some sort of sugar-loaded concoction (you’ll see it in a few days, so sit tight). Ahhh, the Artopita, it’s special. 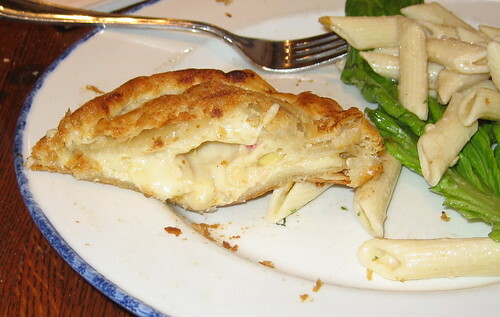 Pictured is the cross-section of the chicken and mozzarella Artopita, known as the Kotopita. It’s a flaky pastry shell stuffed with a mix of artichoke, tomato, fennel, chicken, and mozzarella. It comes with a side of pasta for $6.95. You can use a knife and fork, but I just pick it up because that’s what my grandfather, The Greek, would have done. Keep in mind, I don’t have any idea if this is an authentic Greek dish. Artopolis is in the heart of Greektown, so I assume that it’s at least rooted in some Greek tradition. But frankly, I don’t care. It’s too damn good to care about where it come from, just appreciate it. You bite into the buttery pastry shell with a slight crunch, then you get to the doughy part of the pastry, then to the creamy and savory filling. Perfect. I could have probably had two, but that’s excessive. Artopolis is such a versatile place to entertain or be entertained. They have a bar where you can grab some drinks after work. Their coffee is really good so during off hours they function as a coffee shop. As you can see above, the lunches are great. They have a gift shop and a full-blown dessert case if you need to pick up a gift/dessert on your way to a function. Wow, talk about sensory overload. Posted in food on 2007/05/06 by John.